I confess: I am a machead. 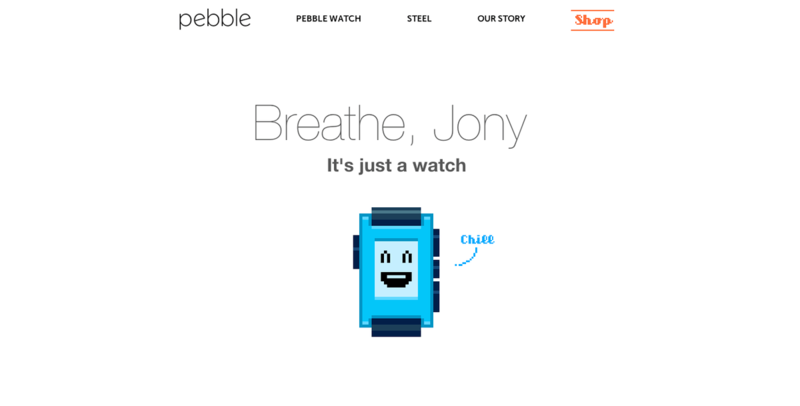 Yet I bought a Pebble as an impulse purchase the moment I saw the new website. It leverages every weak point the Apple watch has revealed so far: pretentious design (even if some argue it’s great), no battery life, almost useless, too expensive. Just a few days after the Apple keynote, Pebble replies: we’re substance vs vaporware, we’re real, we’re fair and square. Oh, we’re cheap (huge price cut on both models). And we have pretty decent battery live (almost one week). Great copy strategy, great execution. Great brand storytelling, told by good old fashioned pixels (no fancy video). Breathe Jony, this round is not yours.